A new idea in packing goods with original “Uni Float” packing technology. The simple structure features cardboard with a pair of tough urethane film sheets. 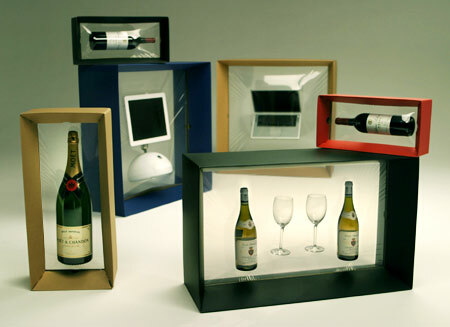 Breakable materials like wine and computers are fixed in the air like framed pictures and protected from impact. Cardboard flames come in a variety of colors so that it can be used for a multitude of purposes from gift-wrapping to display. We pursued functionality so that anybody can wrap up or open a package in a short time. The cardboard and urethane film are fixed by seal. We take environmental safety into consideration as well, by preventing harmful substances from being released into the air when these packing materials are thrown into fire. We worked on research and development of this new product to avoid being swayed by the realignment of cardboard industry, and to accumulate corporate power. We have developed the products by cooperation between industry and university. 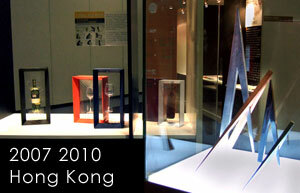 Professor, Architect, Toshihiko Suzuki completed packaging design for the products. Introducing display function and interior taste into a packaging tool, we aimed at developing new uses for packing material and commercialized it. 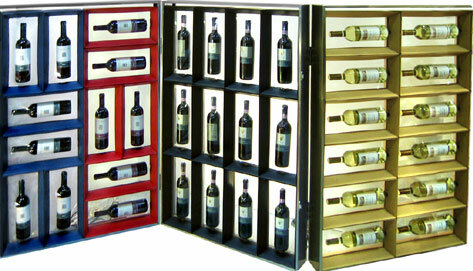 Commercial packaging design has largely gone through few changes over the years. The use of materials cardboard, plastic and styrofoam, function primarily to endure safe protection of products. The relation between product size, weight and fragility directly correlated to an increase in packaging materials – the bigger the risks of damage leads to a greater use of cardboard and styrofoam. From an environmental – our era’s sensitive topic – perspective, not to mention, a cost-savings one, traditional packaging methods simply leave much to desire as ideal solutions in the delivery of today’s products. Inspired by Froshiki, a traditional Japanese art of wrapping ornate cloth to transport clothes and gifts, Cubic floater derives its spiritual function from the ability to wrap around any shape. Its introduction proves the eternal worth of a simple, yet ingenious idea. The solution proposed through its design uses industrial-grade urethane film to effectively wrap items in their entirety. A specifically designed cardboard housing – made of minimal material- holds items place. By simply heat fastening the urethane film with the cardboard, items are tightly secured in a “floating” disposition. Thorough this, products are critically free from direct contact with surfaces, and cleverly protected by the inherent shock absorbing nature of the design. A final cardboard box holds the contents and encapsulates the Cubic Floater for vital protection. The triumph of Cubic Floater belies its “one model fits all” versatility – greatly enhancing its economic appeal. For special needs, an option to custom tailor the design is available. Astoundingly, any increase in product size and weight requires relatively little gain in packaging size and material. The design has seen successful implementation for grass, ceramics, model figures, lamps, hard drives, wine bottles, and countless others. The transparent, picture frame-like orientation gives products an added avenue to showcase components. As an environmentally-friendly and cost effective solution, Cubic floater represents an uncompromised synchronization of demands from both consumer and manufacturer, and is a groundbreaking alternative to the way products are packaged. “I proposed Cubic floater as a new form for the act of wrapping. In Japan, the classical cloth “Furoshiki” is used for wrapping to express love and friendship. I designed Cubic floater with this spirit in mind. I hope that this spirit is common not only to Japan, but also to Asia. Would you consider Cubic floater for special display?